After the models walked, they formed a line, dancing and clapping and shimmying along to the music, out came Betsy, fully decked out in aerobics instructor garb. She lifted two champagne bottles from the ground and began to direct the models through a series of curls, sit ups, crunches, and all kinds of very Richard Simmons-esque shenanigans. 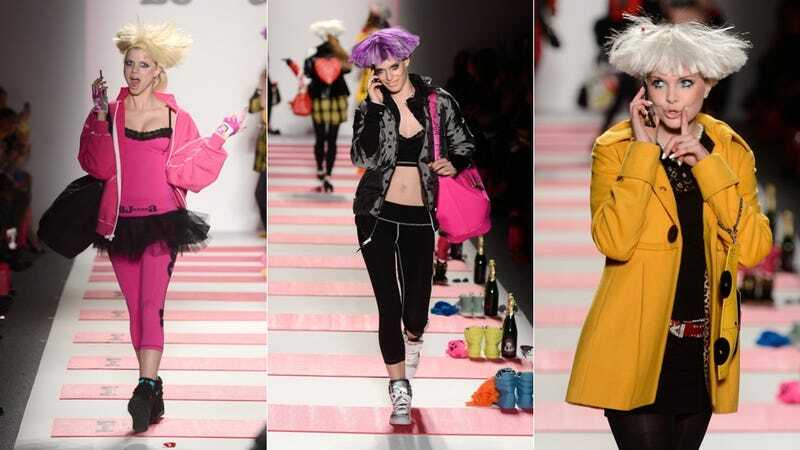 While it made it somewhat hard to see the clothes, It was certainly spirited, and full in keeping with the storyline that Betsey Johnson has been creating since she first got started. It was fun, and lighthearted, and a very welcome break from the ultra-serious quality of much of Fashion Week. And when it was over, and Betsey did her signature cartwheel, the crowd cheered as loud as I've ever heard them at a show. So are workout gear and silly hijinx what we can expect for Betsey from here on out? Well, her reality series, The Betsey And Lulu Show, on The Style Channel is slated to premiere next month, so it seems safe to say yes. Apparently, at age 70, Ms. Johnson is fit as a fiddle and changing careers. Click through to check out the wackiness!